Pictured is vintage Wrigley Field circa 1914. Originally known as Weeghman Park (after its owner Charles H. Weegman), it is the second oldest baseball park in America after Boston ’s Fenway park that was constructed in 1912. Prior to Wrigley field becoming a baseball park it was the home of a seminary. Over the years many upgrades have been made to the park including the addition of almost 30,000 seats (its original seating capacity was 14,000) and lights in the late 1980’s in order to host night games. In the midst of all the upgrades, the original scoreboard still remains today with each scoring inning numbers changed by hand as well as the traditional “W” and “L” (win and loss) flags on top of the score board after each game. The clubhouse’s first team was the Federals and when the Federals stopped playing due to financial issues, the Cincinnati Cubs were purchased and moved to Chicago. 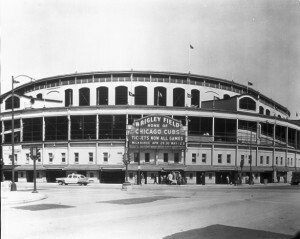 The park became Wrigley Field in 1916 after the Wrigley Family purchased and renamed it in honor of the new owner. The stadiums famous ivy-covered walls were a part of a beautification initiative by the 1937 Cubs General Manger Bill Veeck; the ivy is a mix of Boston Ivy and Bittersweet.